Be Ready to Take Your PMP® Exam! The PM Exam Simulator™ gives you an "insider’s view" of the actual Project Management Professional (PMP)® Exam. Practice on 1,600+ highly realistic PMP® Exam sample questions that were developed based on the current exam specifications. Prepare "like real" with the 90-day access as often as you want. Read detailed explanations alongside all answers and learn why your answer was / was not correct. Learn effective test taking strategies with The PM Exam Simulator and pass the PMP Exam on your first try! Don't get caught off guard on exam day. With first-hand experience of the environment and questions you’ll encounter when you take the exam, you can raise your score, increase your confidence and be fully prepared to succeed. 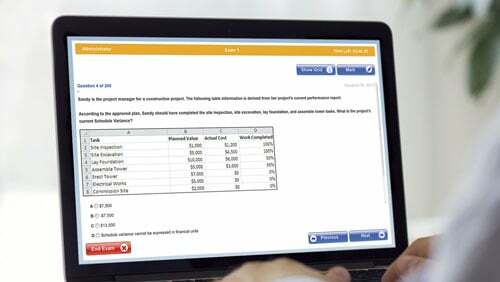 The PM Exam Simulator™ is a web-based PMP® Exam preparation environment. Your username and password gives you instant access from any web browser. There is nothing to download or install. Just log on and take any of the 8 complete PMP® Exams in a simulated environment enabling you to practice what's ahead of you. And because practice makes perfect, this is the absolute best way to prepare. The PM Exam Simulator is a full-featured, online PMP Exam simulation environment used by over 18,000 students. Purchasing The PM Exam Simulator gives you access to the most successful PMP exam preparation tool on the market today. Take exams 24/7 "like real"
The PM Exam Simulator was designed to maximize your experience so that it's almost like the real exam. Question style, question difficulty, question distribution in the Process Groups and the "mark for review" feature ensure that your online testing environment simulates what you will be faced with on your big day.